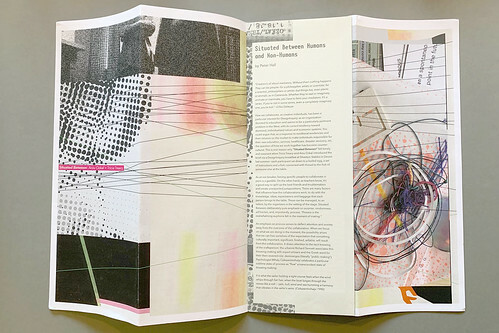 Situated Between is a saddle-stitched, folded 34-page publication that records some freewheeling collaborations involving fifteen designers, writers and image-makers. They are Bethany Johns, Gail Swanlund, Krishna Balakrishnan, Lana Lé, Margo Halverson, Mark Zurolo, Nathan Davis, Peter Hall, Rebecca Ross, Sarah Elawad, Stuart Henley, Victoria Grimwood and Luke Waller, as well as Arzu Ozkal and Tricia Treacy, who put the whole thing together. Treacy plans a second volume for April 2019 with a fresh set of collaborators. 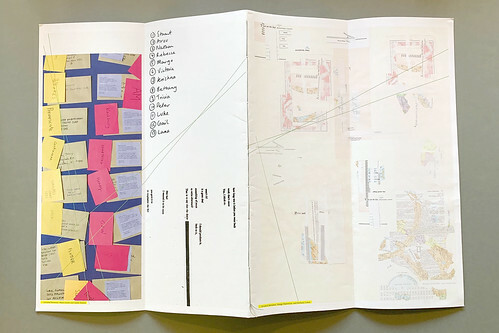 Spread from Situated Between featuring Peter Hall’s essay, printed on a narrow insert. More collaborations from Situated Between. Cover of Crayonograph by Fraser Muggeridge studio. 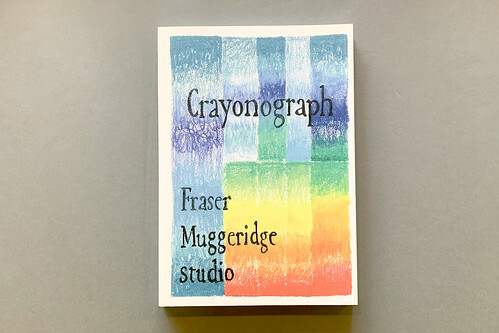 Crayonograph (Actual Source, £24) is a collection of the work of Fraser Muggeridge studio, ‘crayoned’ by designer Abbie Freeman. The book forms a charming studio project, reproducing fifteen years of work in colourful crayon. 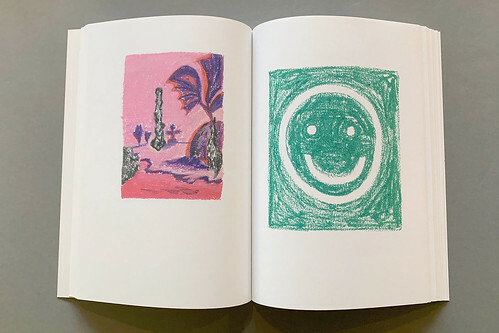 Spread from Crayonograph by Fraser Muggeridge studio, with crayon illustrations by Abbie Freeman. Text on the back cover of Crayonograph touches on a source of inspiration for the project — a 1966 article by Crosby/Fletcher/Forbes, titled ‘A Book of Matches’ in Typographica 14 – where they describe ‘an exercise, to take a simple object and within the limitation of black and white still reproduction, to explore some of the graphic means possible to illustrate it.’ Not limiting herself to black and white, Freeman illustrates an extensive body of studio work, and in the process, condenses 160 projects ranging in format (from books, to posters and exhibitions) into one object. The ‘graphic crayon lens’ brings a new perspective to the studio’s work. 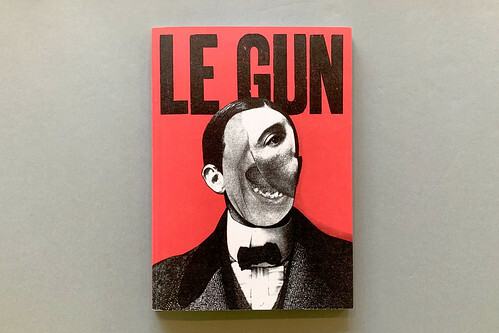 Cover of Le Gun no. 6 featuring an image by Andrzej Klimowski. After a several year hiatus, large-format independent magazine Le Gun no. 6 has been released. 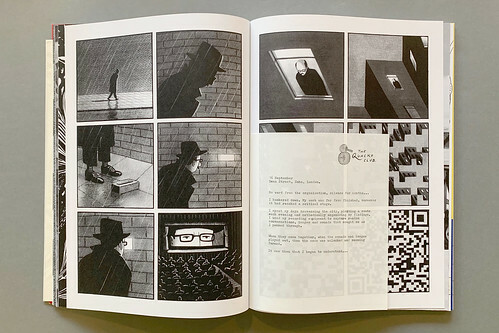 It is conceived and edited by the illustration and graphic design collective Le Gun (the subject of ‘Garage band’ in Eye 64), which includes designers, illustrators and artists Matthew Appleton, Bill Bragg, Neal Fox, Robert Rubbish, Stephanie von Reiswitz and Alex Wright. 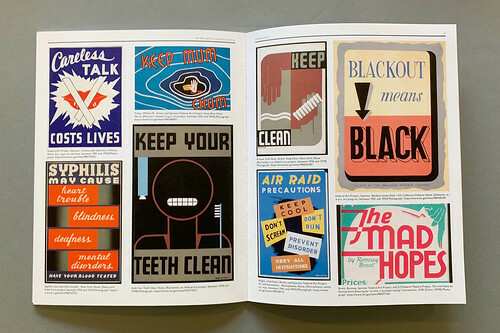 Spread illustrated by Bill Bragg, with one of many interleaved typewritten letters ‘written’ by Herbert Fischl aka James Caddick. Quote by George Szirtes. Letterpress printed quotes are featured throughout the publication. 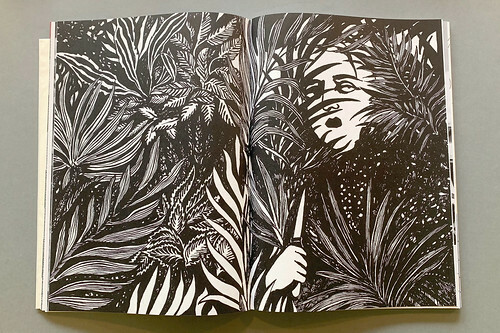 Spread illustrated by Steph von Reiswitz. 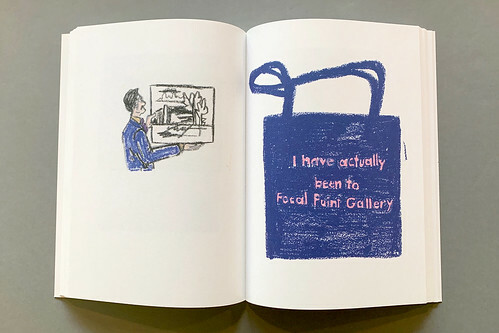 As with all previous issues, it features works that are gathered from an open submission, though a significant portion of the illustrations comes from members of the collective, either co-created or individually authored. 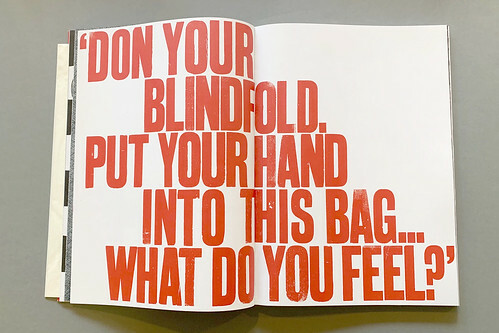 The collective’s editing gives this disparate though equally absurd group of images form, striking a balance between black-and-white images, colour, big letterpress type and typewritten letters – ‘written’ by Herbert Fischl, actually the fictional creation of James Caddick. Other contributors include Sam Winston, Tomi Ungerer, Peter Blegvad, Russell Weekes and Laurie Lipton, among many others. The issue’s cover features an illustration by Andrzej Klimowski (see ‘Body of work’ in Eye 97 and ‘Theatre of dreams’ in Eye 14). Rectangular doily to mark the Bauhaus centenary produced by the Center for Design Research in Slovenia. 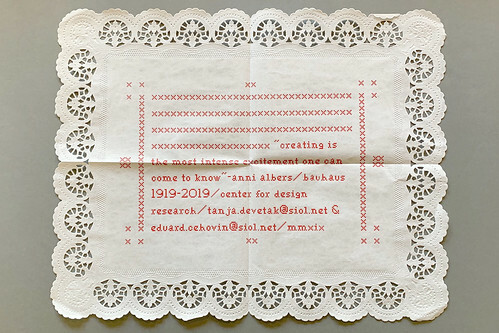 This rectangular doily marks the Bauhaus centenary – celebrated this year – with a quote from textile artist and printmaker Anni Albers, who was also head of the school’s weaving workshop. 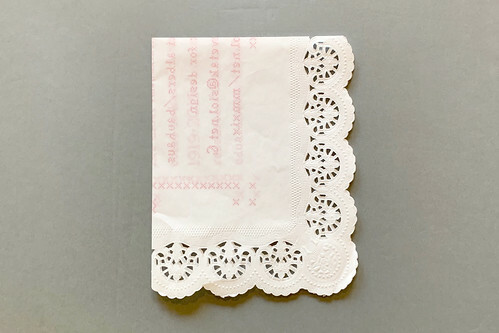 The doily was produced by the Center for Design Research in Slovenia, an independent organisation established to connect designers, artists, practitioners and theoreticians in Southeast Europe. Cover of The Pre-Vinylite Society Journal no. 1. 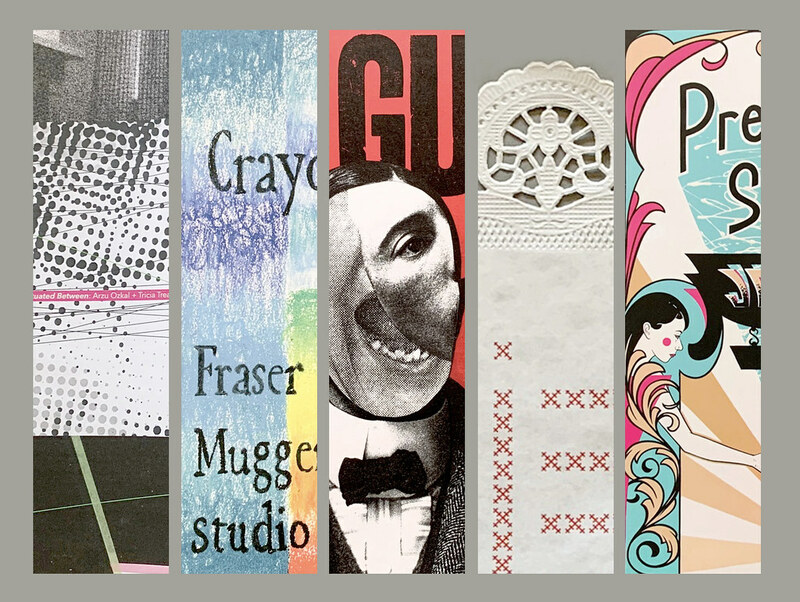 The Pre-Vinylite Society Journal, written, designed and edited by fifteen volunteer contributors, is a platform for the exploration of contemporary sign painting, and its basis in cultural and historical contexts. It builds on a solid base of research and collaboration that began in 2010, and has since included eight publications, seven exhibitions, and thousands of members. Spread from The Pre-Vinylite Society Journal no. 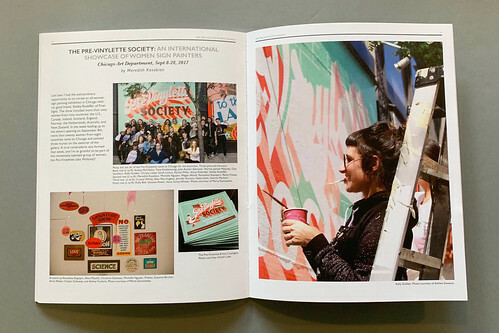 1, showing an article by Meredith Kasabian (curator and co-founder of The Pre-Vinylite Society) about an international showcase of women signpainters. As one might expect from a subject with such breadth, the journal offers a varied and engaging range of material: from Gabriel Cira’s ruminations on signs, architecture and the ‘ecosystem of visibility’, to Liz Woodward’s enquiry into the historical role of signs that no longer point to anything. Alongside these abstract inquiries, the editors still find space for the more familiar articles on inspiration, featured artists, and likeminded events. 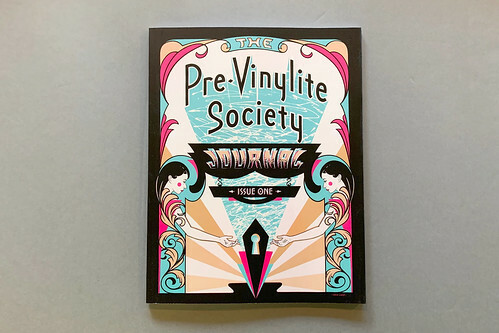 And in presenting this varied content side-by-side, The Pre-Vinylite Society Journal makes certain of one thing, that signs – old, new, or redundant – remain meaningful. See ‘Weapons of craft and satire’ on the Eye blog. Spread showing ‘Inspirations’ by Josh Luke (designer and co-founder of the Pre-Vinylite Society) for his current work.